If you're craving something rich, sweet and decadent but you don't want to worry about calories or future dental bills, grab a box of white velvet, whoopie cream goodness and indulge. Farmhouse Fresh Whoopie! Deluxe Boxed Gift Set is the perfect delicacy. When this gift set landed on my front doorstep, I was first delighted by the presentation. 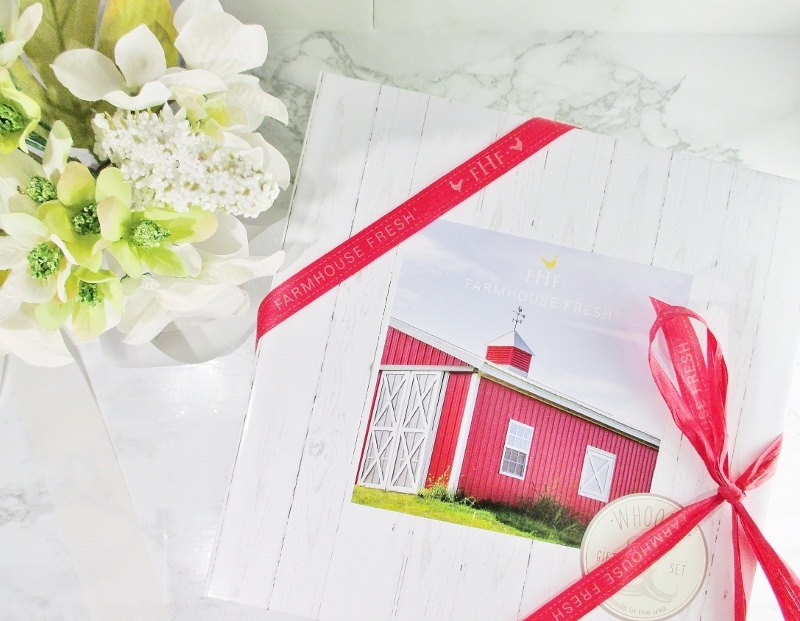 The heavy paper stock box is printed with a wood pattern, fresh, green leaves and a pretty, red barn and tied with a red logo ribbon. No gift wrap required! This is one of those keep it for other purposes box. I already know what I'll be stashing in mine. I opened the lid of my gift box and I was greeted by a waft of that delicious aroma and four of FHF's Whoopie! Cream products. A full size body lotion and hand cream, a travel sized body wash and a petite candle round out this collection. A glass jar holds a scented soy based candle. It smells great, cold. I haven't lit it, yet. I keep forgetting to pick up a candle lighter. Apparently I have forgotten how to brain. 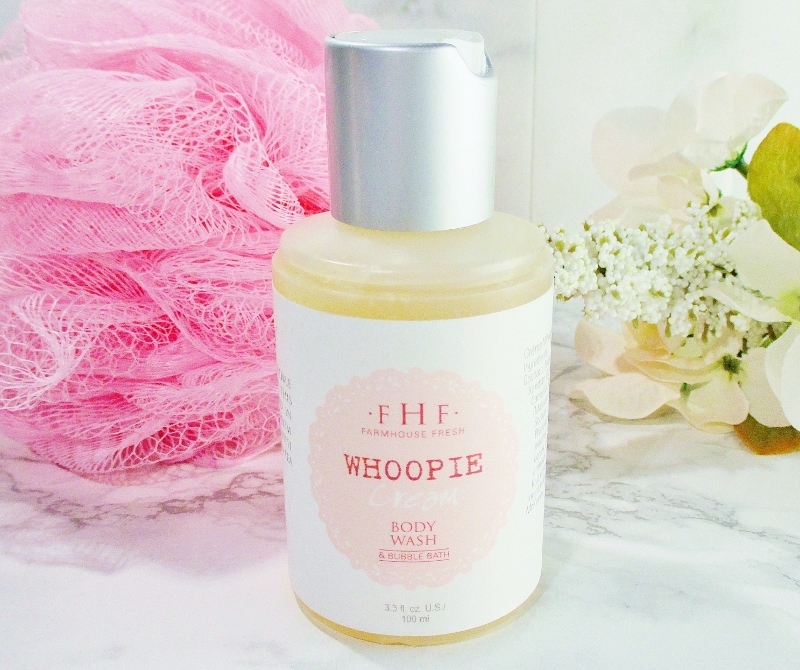 Whoopie Cream Body wash. Hello bubbles! Squeeze some out onto a pouff and revel in rich, cushioning lather and that utterly delicious scent. I have very dry skin, I don't find this body wash to be hydrating but it doesn't dry my skin so it's a hit. 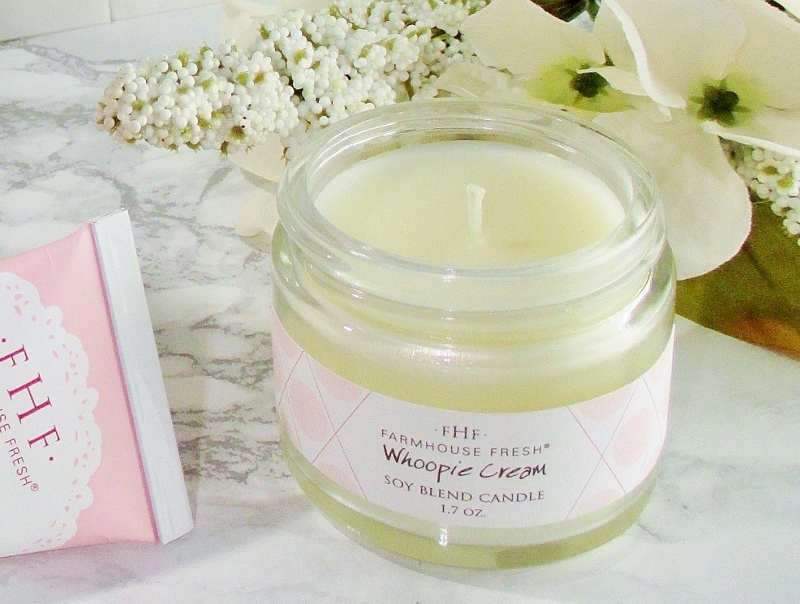 Keep the pretty party going with Whoopie Cream Shea Butter for Body. A pearly white, thick body lotion that smooths into the skin, softens and makes my skin look smooth and a little younger. The scent lasts for hours and so does the softness. This lotion is packaged in a pump delivery glass bottle so I make sure that I'm not mixing this bottle with slippery hands and a hard floor. And finally, pamper your hands and cuticles with Whoopie Cream Shea Butter Hand Cream. The first FHF product I bought was a tube of this hand cream. I loved it and I'm so happy to have another tube! No calories. No guilt. Just delicious indulgence and soft, sweetly fragrant skin. What more could you want? If you are ready to treat yourself or someone special, hit up Farm House Fresh online and in select salons, spas and boutiques, worldwide. Check out their social media, too: Visit on Facebook, follow on Instagram and Twitter. Farm House Fresh Goods are made with natural and organic ingredients and are cruelty free. This looks like a pretty great boxed gift set. It is the most delicious, isn't it? I'm going to cry when that body wash is gone. I hope that you get one, it's wonderful. I don't mind Valentine's Day, but I like your way of thinking. I'd be all about treating myself to this lovely looking gift box! HAHA, I reviewed this set recently as well! I love it so much!!!!!!!! Perfect Valentine's Day Gift! I used to enjoy Valentine's Day, but now it has become too commercialised. And, too soon after all the Christmas spending. That said, I wouldn't mind receiving this gift box at all! I love this set and the scent! FarmHouse Fresh is my jam! I bought a set of Whoopie! products over the holidays and it's amazing. I am actually working on this post to release in the next few days. 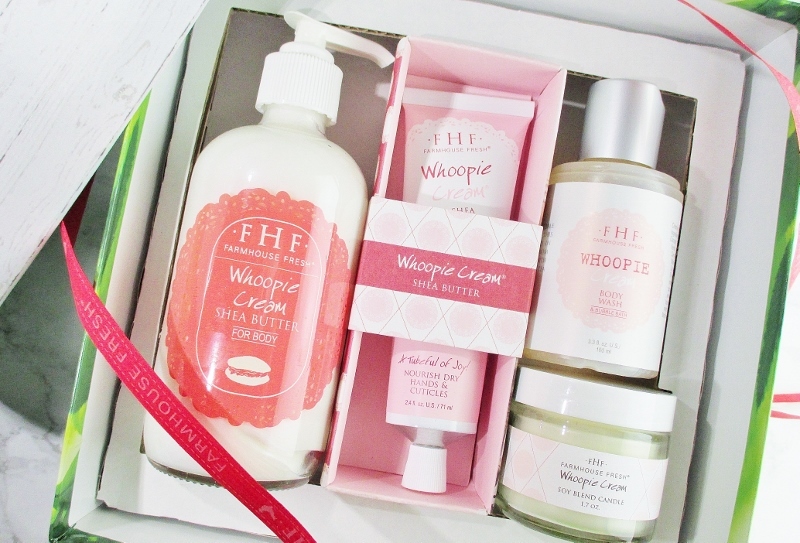 I'm loving t his set = the whoopie products are so awesome. I love this scent! I didn't know they did candles, but I'm definitely going to need one. That's a lovely box of goodies!